A daily oral care program is essential to maintaining healthy teeth and gums. The foundation of a good oral care program is to reduce plaque and prevent its long-term accumulation. 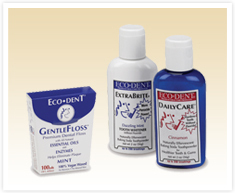 According to dentists, “the most effective method of plaque control at home is brushing and flossing.” Eco-DenT® provides a complete line of natural oral care products to help maintain good oral hygiene between regular checkups by your dentist. Eco-DenT® has more clinical research supporting the benefits of its product than any other natural oral care product line.